A concise research over strings attached with our new inventory. Today’s military hardware is evolving rapidly into more advance and complex technology due to usage of computerized system’s which seems to have no bounds to expansion. Combat aircrafts are no different and so is the F-16 Fighting Falcon which has been ruling the skies of the world by becoming the mainstay and backbone of 26 different Air Forces across the globe. Apart from positive aspects of computer control in F-16 which are for example Fly by Wire system (FBW) etc. There are negative aspects as well which limit the capabilities and usage of a certain components aboard the aircraft. Pakistan’s F-16s have been very controversial in this case. Thus I carried out a research over the matter in question. 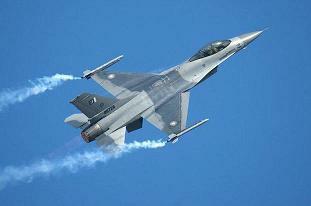 As we know, in 1991 US halted the delivery of remaining F-16s on order due to concerns over Pakistan’s nuclear program. It was not until 2001 when Pakistan became the first non-NATO ally of US and the delivery of the remaining embargoed and new F-16s was given a green signal which bore fruit – and currently Pakistan operates a fleet of 45 F-16 Block 15 (1980s built) and 18 advanced F-16 Block 52s (2009/10 built). It is not clear whether PAF’s F-16 fleet posses such software confinements. The only way to determine the actual truth will be in the case of Pressler amendment of 1992 repeating itself. F-16s can be equipped with wide variety of hardware and a vast array of weapons which can transform it into a very formidable fighter for the enemy. Pakistan Air Force was however denied certain components for its F-16 Block 52s which come standard on USAF F-16 Block 52’s. The major component which is worth mentioning is DRFM (Digital Radio Frequency Monitor) which digitally captures and retransmits the RF signals which is than used to jam the radars onboard other platforms being used by the enemy. This component is present on new F-16s purchased by Poland, Korea, Turkey, Israel, Chile and Greece. Many years ago, it was found that Egyptian Air Force (EAF) F-16 Block 40s were found to have ‘reduced’ fuel tank capacity which means that Egyptians F-16s had lesser range/combat radius as compared to standard F-16 Block 40s flying with other Air Forces. According to experts, it was done to make EAF F-16s incapable to attack Israel without an air refueling tanker which EAF does not operate. Thus such modifications may be present in Pakistan’s F-16 fleet but there have been no such reports regarding the matter in discussion. This is a very controversial matter. Kill switch is a general name of a certain component which can cause disturbance or can completely destroy the flying F-16 by interfering in its command and control system according to directives of parent company/government. Till now it has been denied repeatedly by PAF officials but some experts still believe in this. In modern era of global positioning system (GPS) and the likes, there is nothing hard in tracking or keeping a record of anything, may it be a vehicle or a cell phone. F-16 is no different. It is believed that US has installed tracking devices in our F-16s so that they can have their complete track and movement history. This was primarily done to prevent our F-16s from going to China or any other location prohibited by agreement of FMS (Foreign Military Sales). This theory is supported by the crash of Turkish F-16 Block 52 which revealed certain ‘sealed’ components during air crash investigation which were later determined their identity to be as ‘tracking devices’. The above mentioned theories can be assumed flawed if we look in the past when our older F-16 fleet was combat ready through out the embargo phase (1992-2001). But with time, technology has progressed very far and we just have to keep our fingers crossed to know the actual truth regarding strings attached with our new F-16 fleet.